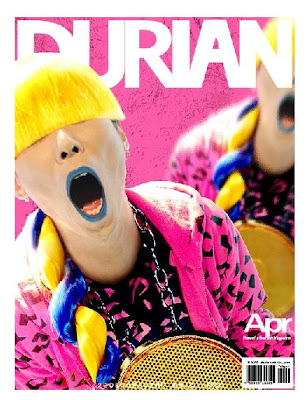 Anyway onto Durian magazine. Basically its like Fruits on Acid...it shows Tokyo how I know it, colourful, crazy and hyper fun! All my Japanese friends would always say Fruits was kinda dead now, that it always has the same people and hardly any colour anymore, even though said friends were often featured in the magazine, but they were the only bright spark in the whole issue. It seemed to me that Fruits was sorta distancing itself from the typical "Harajuku" colourful looks made famous but Gwen Stefani and had moved to a more subdued almost avant-garde look that is the total opposite of what made the magazine famous in the first place. 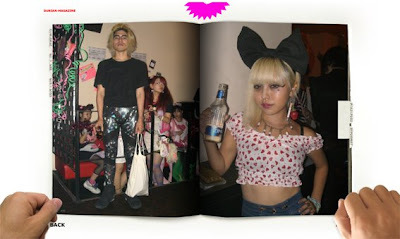 So if you want to see what Tokyo-ites are really wearing check out Durian Magazine. The above shots were taken at Teenage Kicks. I was actually at this party and I saw the Spank girls holding that sign above....its how I first found out about Durian. 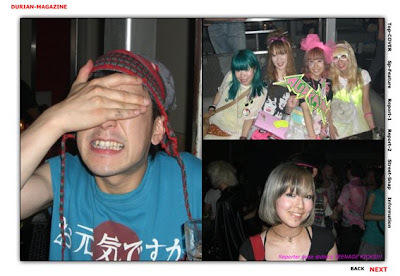 A Spank fan who came to our wedding and in the glasses is Yohei in a hoody Henry also owns from Romantic Standard in Harajuku (a girls shop actually). Gallermic aka TFR aka my best friend in Tokyo and my old housemate. I miss you. 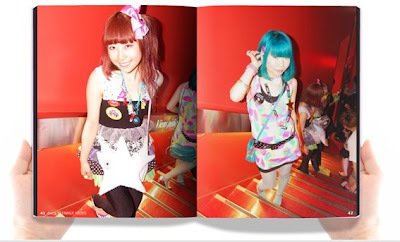 On the right is Maya, Saki and Yuki my other best friends in Tokyo who I missssss like CRAZY! Yohei again looking cool in black sparkly tails and Igalliano barefoot and fabulous like always. 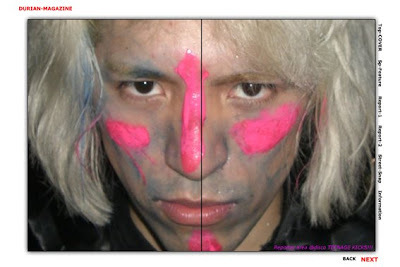 Gallermic looks super crazy here...a mix of Ganguro boy and Manga character, are they AA leggings??? 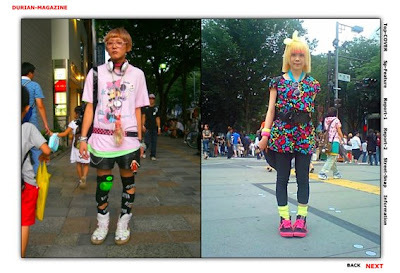 The blonde is Petty, a super cool Tokyo fashion model and stylist. 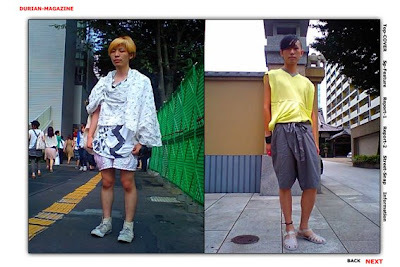 The boy on the left is Hachi, a fashion designer and Gallermic's new housemate. His designs are so amazing and I think what he is wearing is something he made. I feel bad that the nick name for our dog is his name, as in we shorten Hachiko to Hachi...everytime we say it I think of him. On the left is Yulia, who dj's at our wedding. She has dj'd at Louis Vuitton parties and for celebrities...and me and Henry YAY! Ok so doing this has again made me sad and miss everyone again, but I will see them all in 5-6 months hopefully so not long, yay. I can't wait to see what people are wearing then, and if colour is still the in thing or if black and tonal looks have snuck in. Who knows, Tokyo is always changing. That's why you have to keep looking at Durian magazine, it gives me so many ideas...if it does eventually load! oh the guy wearing blue pants holding blue bags, he's a korean model or something, called xin. nice entry ! haha sweet hayley you know what i like to keep cool things secret too! i know it since a while its reaaaallly reaaallly cool! the name of the magazine alone has gotten me interested. your so lucky to have lived in japan! i'm so blinded from all that colour, its fantastic. ah! I love durian. Whenever i model my outfits after them, I never look as good through. oh well, I'll keep trying. hey kiddo, glad you read your up and running! Thanks for sharing the mag I enjoyed! This looks like the coolest magazine on earth, i know how hard it can be to share a love, especially when it falls into the wrong hands ;) so thank you for sharing this lovely bright magazine!